Offering students and practitioners an applied approach to the subject, Organizational Culture in Action (OCA) walks them through a six-step model for analyzing an organization’s culture to provide insight into positive communication practices to improve organizational ethics and effectiveness. The authors review relevant theory while integrating a constitutive approach to studying organizational culture and communication. Practical guides for multiple data collection methods are provided, and the workbook format is full of interactive tools that engage students and reinforce learning. The revised OCA cultural analysis model in this edition provides the below elements. 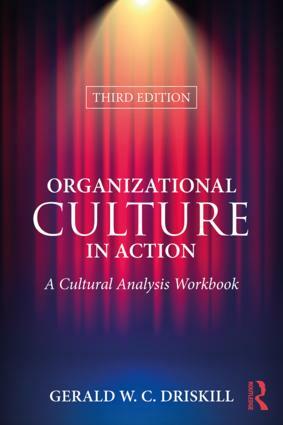 • The revised first step in the model – "articulating the value of cultural analysis" includes connections to public relations and crisis management. • A definition of communication and the analysis process that foregrounds ethics throughout the book is included. • Recent research on organizational moral learning is integrated in the ethics chapter, and throughout the book. • The Communicative Constitutive of Organizations is now foregrounded throughout the book, and reflected in a table capturing variable and metaphor approaches to culture. • The latest applied research is integrated in units on diversity, change, leadership, and effectiveness in relation to positive organizational communication. • Enriched guides on multiple data collection methods now includes surveys. • Cases, examples, and applications relevant to crisis, employee engagement, virtual organizations, conflict management, and public relations are provided. Professionals come away equipped to apply cultural insights to fostering inclusiveness in relation to diversity, supporting organizational change, making leadership more dynamic, understanding the link between ethics and culture, and achieving personal and professional growth.